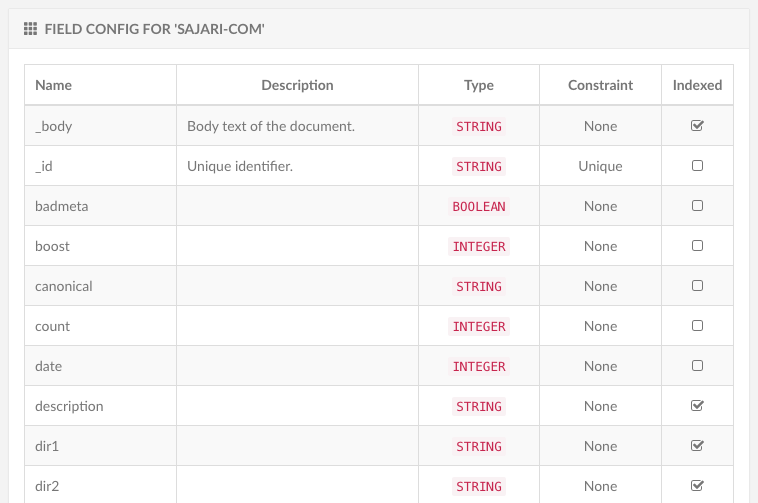 Sajari is a highly configurable search and matching engine. The matching configuration can now be customized on individual operations by adding components to requests. Below is a brief insight into some of these options to help you get the best out of your Sajari. Each record (analogous to database rows) stored in Sajari consists of multiple "fields" (analogous to database columns). Fields can influence search results, find duplicates, create matching algorithms and much more. Field configuration sets up how fields are stored in Sajari, a brief explanation is outlined below. 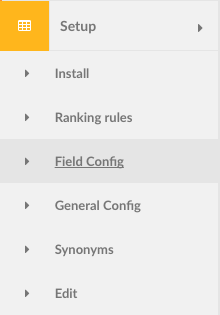 Field configuration has a row for each field in your collection. As soon as you create a new field (automatically happens with custom annotation of crawled webpages) it will appear here in this list. These turn features on for each given field. If you use an automatic collection (crawls and indexes your website) then these will be preset for you. Otherwise you'll need to create these fields before you begin loading records. If you load a record that doesn't exist, it will be created as a string field, so normally better to customize these upfront. The indexed option makes the field keyword searchable (it will always be available for filters, facets, etc regardless of this setting). Note: This is not currently retro-applied, but will be in the near future. The constraint option allows fields to be "required" (records without this field will be rejected) or "unique" (records with this field are required and must also be unique). Unique makes the field into a hash key lookup for records, so you can get/replace/remove records using this field as a lookup (analogous to a database unique ID). The type option is used to indicate how the record is stored and can be handled in queries. These types can also be repeated by checking the list field. Sajari is a matching engine that goes well beyond typical search technology. Matching means there can be substantially more input information in a query than a traditional keyword search. This can include many fields of free text, numbers, lists, etc. Queries can look very analogous to documents, i.e. they have multiple fields, can be numeric, lists, strings, categories, etc. In order to use these components we offer two methods, pipelines and constructed queries. A Pipeline is actually a constructed query under the hood, but for convenience it is named so the complex query underneath does not need to be reconstructed over and over and only the inputs to run the pipeline are required. Below are some of the query options that can be used to construct queries and pipelines. See more information on how to boost fields to construct queries and pipelines. For those who need something not listed above, please contact us as we possibly already support what you need.